OK, it's time for that summer meeting of Cambridge Democrats! We're pleased that Phin Baxandall, Cambridge resident and Senior Policy Analyst at the Massachusetts Budget and Policy Center, will be joining us to speak about the state budget. The budget is where the rubber meets the road, and we Democrats will want to pay special attention to the collision of policy with reality that MassBudget knows so well. We've asked Phin to focus on the healthcare and education budget, especially with reference to federal cuts. So let's spend a pleasant summer evening in lively Democratic company! Parking: Use street parking if possible. As you enter Hovey Street from Cambridge Street the second lot on the left (across the street from the hospital) can be used for parking. The first lot closer to Cambridge Street is used for visitors and physicians. The next meeting of Cambridge Democrats will be on Wednesday July 26th, not June 29th as previously announced. We'll post the location and time when that information becomes available. 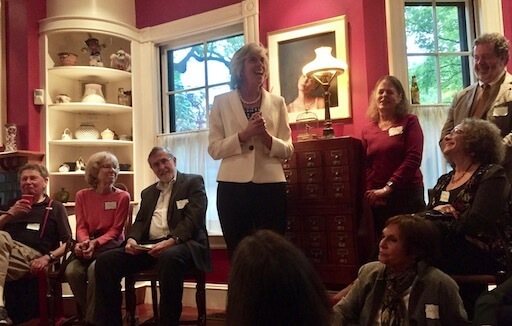 Cambridge Democrats were delighted to have Representative Katherine Clark speak at our annual fundraiser! It's not too late to contribute to this year's fundraiser and join the fight! Spring has finally arrived, after what already seems like the unending winter of the Trump administration. Perhaps warming weather will help us cope with the ongoing barrage of craziness! So let's gather to support each other as fellow Democrats! In this meeting we will make our action concrete by taking up the CDCC budget for the upcoming year, and by deciding on the proposed Sister District relationship between the CDCC and the Delaware County (Pennsylvania) Democratic Committee.